With the start of auspicious Kumbh Mela of 2019. People from different states and countries are coming to take the holy dip in the Sangam – a confluence of Ganga, Yamuna and Saraswati rivers. 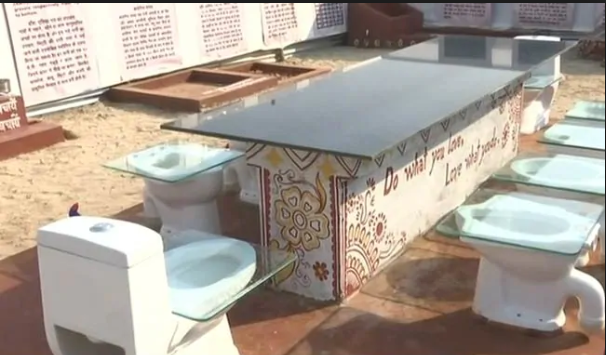 For this auspicious occasion, the government has built a unique ‘toilet cafeteria’ which is drawing the attention of a lot of people. The cafeteria has commode-style chairs reflecting the importance of sanitation and hygiene. Kumbh Mela which started on the day of ‘Makar Sankranti’, January 15 will end on March 4. More than 10 Crore pilgrims are expected to take the holy dip in the ‘Sangam’. Around 2.2 Crore pilgrim took bath on the first day of the mela. PREVIOUS POST Previous post: ‘Gurmeet Ram Rahim’ sentenced to life imprisonment in 2002 Journalist murdered case.